The Proferred Retractable Utility Knife with pop up blade dispenser release button allows instant blade storage and change. 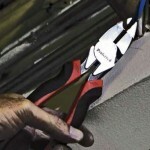 Hassle free and no tools required for a quick blade change! The SK2 blade storage and dispenser holds up to 5 additional blades. Featuring thermoplastic rubber (TPR) grips offering thumb rest and comfortable use with less slippage.